Isshido Ramen opens in Mira Mesa on Feb. 17. 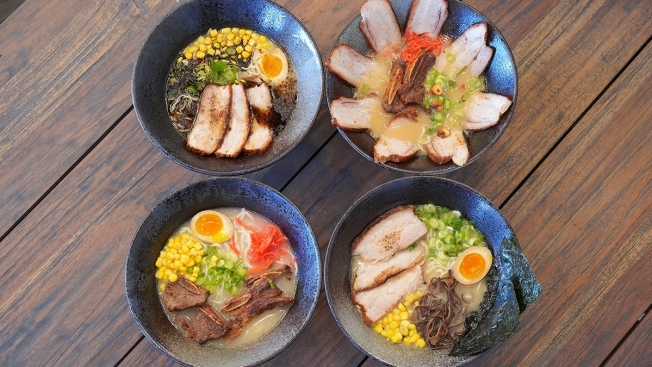 The eatery offers classic tonkotsu ramen, made with a milky boiled pork broth and topped with sliced pork belly and other garnishes, as well as a variety of other options. Eater San Diego shares the top stories of the week from San Diego’s food and drink scene, including a look at three fresh Asian eateries serving up sizzling specialties. Opening this Sunday, Isshido Ramen offers a variety of ramen styles including classic tonkotsu, chicken, vegan spicy miso, and a version flavored with truffle sauce and truffle oil. The eatery's menu extends to feature appetizers, udon, and panko-crusted, sake-marinated prime steak. A Chinese chain called Harmony Pot Sticker arrived in Kearny Mesa with a casual menu centered on potstickers – or pan-fried dumplings – that are made daily using handmade dough and fillings that range from pork and cabbage to shrimp and chives. Cold appetizers and soups round out the menu. The latest addition to San Diego’s Korean-style fried chicken landscape has opened in Poway's Atlas Market. The Furaido Premium Chicken Co. food stall serves crispy wings, tenders, and drumsticks with 15 different flavor combinations including soy-garlic glaze, barbecue dust, and butter honey dip. North Park's JuneShine Hard Kombucha is expanding to Scripps Ranch, where it will take over the original production facility of the legendary brewery, Ballast Point. JuneShine will start making its organic hard kombucha in the space this summer, where it will also open a tasting room. The WestBean Coffee Roasters has opened its Bay Ho roastery headquarters to the public. Featuring a café with indoor and outdoor seating, it serves a full coffee menu including cold brew on tap and pour-overs and a growing list of breakfast bites.